All FSA ABS (asymmetric bolt spacing) cranks like Gossamer, SL-K, K-Force, K-Force Light. Both 4 and 5 bolt versions. One model fits them all. Di2 Compatible. 10 / 11 / 12spd compatible. ABS cranks only. For K-Force - purchase additionally absoluteBLACK bolt covers. This is Absolutely necessary as you will not be able to mount these chainrings to K-Force otherwise. If you wish to use other configuration it will also work, but shifting will be slower and may require more "adjustments" of front dérailleur to be acceptable. Also remember that front dérailleur can only accept max 16T difference between 2 chainrings - this is how Shimano and Sram designed them. For K-Force Light- place the big ring first on the outer position of the spider, then place small chainring on the inside of the spider. Use absoluteBLACK bolt covers and place them from the front on big ring. Tighten with provided bolts while holding the bolt covers by hand from the other side (this is important to not to damage the bolt covers). Tighten all four bolts with force of about 5-7Nm. Mount your crank back to the bike. You may also need to adjust the front derailleur slightly. Absolute Black always recommends using a new chain when fitting new chainrings. When mounting absoluteBLACK 4 bolt chainring on 5 bolt crank, leave the hidden bolt hole empty or patch it with waterproof grease. This hole is not important hence FSA removed it with new version of cranks. To proceed with the adjustment you will need 2mm and 5mm allen keys. *If your derailleur overshifts the chain when moving from small ring to the big ring, it means your "gap" is greater than 2mm when chain is on big chainring (see video). You may need to reduce the gap. Your front derailleur may also be too high compared to what is advised on the video. Last thing to check is if your cage is parallel to the big chainring face. *If your front derailleur is hesitating to shift from small to the big ring then two issues may be present. 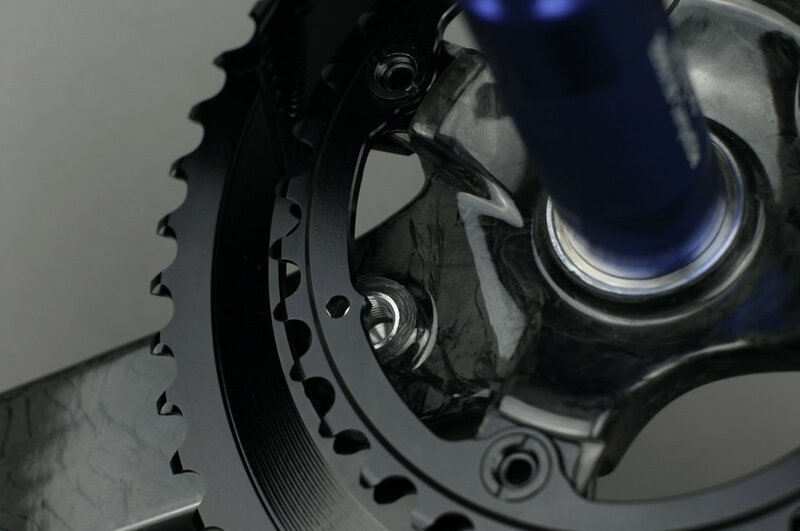 The "gap" may be too small (It has to be 2mm - see video) or your cage is not parallel to the big chainring face. All Absolute Black products are designed in UK and manufactured in Poland (EU) to the highest standards of quality. Cranks visible on the photos are not included to the purchased chainrings.